Brought to you by Royale Properties Ltd, the new Brixton Surrey townhomes are located in the Panorama neighbourhood. The actual project site is at 60th Avenue and 144th Street Surrey BC and there, homebuyers will find a new project with 2 and 3 bedroom townhomes. The presentation centre and sales office is NOW OPEN! Brixton Townhomes are located at 14433 60 Avenue Surrey (on the corner of 144th Street and 60th Avenue) and will be open daily 12pm – 5pm, except Fridays starting in early May! The spectacularly affordable pricing starts from just $294,900. Opening This Saturday May 3rd! Please register online at www.brixtontownhomes.com for more details. Stylish Can Also Be Very Practical. The grand opening launch at Brixton Surrey is now on with the unveiling of two beautiful designer display homes, showcasing both the light and dark colour schemes. According to the latest email blast, the Panorama Surrey Brixton townhomes were designed with a purpose in mind: to provide a comfortable and practical solution or how and where you live. Some of the meaningful features and finishes here at Brixton Surrey includes an impeccable location in the highly sought after Panorama neighbourhood. Here, you will find top ranked schools for all ages, urban parks, green spaces, plentiful shopping, boutiques, cafes, services and restaurants. In addition, Panorama Surrey has features many community centres and an easy/quick commute to major routes including King George Highway, Highway 99 and Highway 10. The property itself is located adjacent to a protected and very beautiful greenbelt with a creek bed. You’re also within walking distance to beautiful trails that create a park-like setting within your own community. All home owners at the new Surrey Brixton townhouse community will have exclusive access to the Brix House, a 1,500 square foot amenity clubhouse that was professionally designed with you in mind. Inside, the new Brixton Surrey Panorama townhomes will feature open concept kitchens with some floor plans allowing for dramatic kitchen islands with plenty of cooking/entertainment space and extra storage. Other interior features include convenient powder rooms on the main floor in all homes in addition to wide plank laminate floors on the main level. The kitchens will also feature full height marble tile backsplash, and luxurious quartz counters. THE WAIT IS OVER: BRIXTON SURREY TOWNHOUSES OPEN SATURDAY MAY 3RD AT NOON SHARP. Royale Properties is pleased to announce that Brixton, a collection of 2 & 3 bedroom townhomes situated on a gentle slope in Surrey’s Panorama neighbourhood, will be open for sales on Saturday, May 3rd. Over the past week many pre-registrants have already scheduled a time slot with the Brixton Surrey townhome team. For those who have not had an opportunity to secure an appointment Royale Properties urge you to book today as they are scheduled on a first come first serve basis for these brand new presale Surrey Brixton townhomes. With homes priced in the $200’s, there’s already been a great level of interest in this first release. 2 & 3 bedroom Surrey townhomes are coming this Spring! Priced from under $300,000, the new Surrey Brixton Townhomes features a collection of both two and three bedroom townhouses located in the family friendly neighbourhood in Panorama Surrey BC. Surrounded by beautiful green spaces and parks as well as beautiful pedestrian pathways, the Brixton Surrey townhomes is the perfect place to retreat and relax. The floor plans will range in size between 1202 to 1512 square feet and they are located in Panorama on the corner of 144th Street and 60th Avenue Surrey BC. VIP registrants will be amongst the first to be contacted to take advantage of pre-sale pricing, so make sure you register online at www.brixtontownhomes.com today! The Panorama Surrey Brixton Townhouses Now Launched! Priority register today for this new collection of Surrey Brixton townhomes for sale that include both 2 and 3 bedroom layouts. Situated in the highly sought after and affordable Panorama Surrey neighbourhood, the Brixton townhomes will have English Tudor architecture including bay windows, brick siding and accents as well as large outdoor living sapces for all homes. The crisp and modern interiors will also feature powder rooms on the main for extra convenience. Great views and an excellent proximity to the Bell Centre for the Performing Arts in addition to top ranked elementary and secondary schools are other selling features for the new Panorama Surrey Brixton townhouse community that will situated at 60th Ave and 144 Street Surrey. It’s anticipated that presale pricing will start from just the high $200,000’s. Coming Spring 2014! There’s a new kid on the block! Brixton is a new collection of 2 and 3 bedroom Surrey townhomes that present exteriors with charm, interiors that are modern and practical for today’s homebuyers. 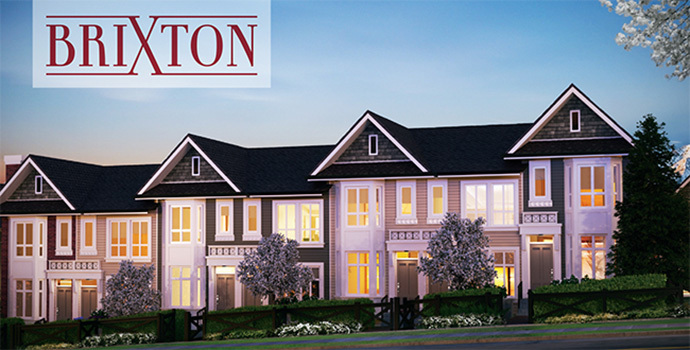 The homes at Brixton living range in size between 1202 and 1512 square feet and they are located in the prime Panorama Surrey real estate district on the corner of 144th Street and 60th Avenue Surrey BC. Meet the new kid on the block soon!